I was recently visiting one of my favorite little, underappreciated museums, the New Haven Historical Society, which has nice displays of Early American furniture, oystering relics like barrels and tools and also a research library containing a the Dana Collection, an invaluable and obsessive scrapbook of New Haven history in pictures. In the little gift shop, alongside deaccessioned old books for sale is an extensive rack of the Connecticut Historical Society’s Bulletins from over the years. One in particular caught my eye: an old, stamped or letterpress ad was pictured on the front cover -”Washington Daguerreian Gallery, No. 136 Main Street.” The ad gave no hint as to the race of the photographer, but it turns out that it announced the services of Augustus Washington, the vanguard black photographer of Hartford. The article, by David O. 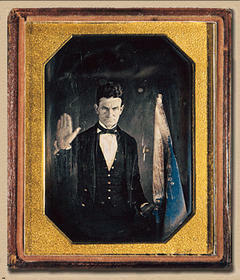 White, says that he was practicing the art of the daguerreotype from the get-go in the 1840’s and in the first half of the 1850’s. He was born to an Asian mother and a former slave father in Trenton, New Jersey in the early 1820’s, and his major ambition was to go to college. He pursued studies at the Oneida Institute, Kimball Union Academy and at Dartmouth College, the latter of which had opened its doors to African-Americans as early as 1824. During college, his parents refused to support him financially because they “were not in favor of such a waste of time in studying,” a line taken from Washington’s own writings. Sadly, he had to leave school in order to go out and work to pay his debts, but not-so-sadly, he did so by becoming a photographer, another thing his parents disapproved of, apparently. he had learned photography his freshman year in college. Against the obvious odds, he was able to pay off his debts, and some of his biggest clients were members of the faculty at his former school in Hanover. In Hartford later, he become a teacher at one of Hartford’s only two black schools as well as operated a studio. Even though directories listed black businesses separate from whites’, Washington’s studio was listed under the white establishments, probably because many of his customers were Caucasian. (The Saunders’ Brothers tailor shop was also listed across color lines.) He also advertised the services of his new enterprise in the pages of Connecticut's antislavery newspaper, the Charter Oak . His was one of only 5 studios in the city at that time, and 4 of them were all on the same street. In 1854, he gave up his business to travel to Liberia, where he staunchly advocated the colonization of free blacks. He was sure that it was Africa that should be every black American’s new home, and part of that was because of the lack of opportunities for them in the United States. There he worked as a high school teacher, a photographer, a farmer and a store operator. At least once he complained that his work was more physical than mental, though he stated that he was happy there.